The European Academies constitute a unique pan-European knowledge base that is trusted, non-partisan and long-term. The Academies therefore have an important contribution to make to debates regarding sustained digital infrastructures and project-funded artefacts, the achievement of long-term durable digital preservation, and the societal responsibility for preservation of our digital cultural heritage. The E-Humanities Working Group is charged with identifying and raising awareness for priorities and concerns of the Digital Humanities, and contributing to the Open Access agenda from a Humanities and Social Sciences perspective, and building consensus for common standards and best practices in E-Humanities scholarship and digitisation. 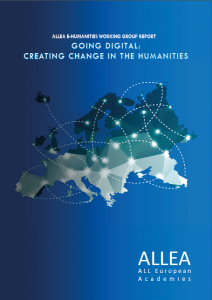 The Group’s first publication, Going Digital: Creating Change in the Humanities, made recommendations around archival sustainability and data training required for achieving Open Access and Open Data goals across the Humanities. Humanities data can be rich and complex, non-standardised in format, without common or consistent metadata and ontologies, and can be subject to complex rights issues. Consensus and best practice regarding digitisation and metadata standards for common usage, that still retain the richness of different disciplines and data types, could enable open access to Humanities data, and facilitate data exchange and sharing between the wealth of archives, repositories and libraries across Europe. Going forward, the E-Humanities Working Group is focusing on the European Open Science and Open Research agendas, identifying growth opportunities for Humanities scholarship, as well as the contributions Humanities methodologies can make to truly opening research.